Lately I’ve been on a felt flower kick. It’s a fun excuse to add some florals to my studio that I don’t have to water, and it’s a nice crafty break from sewing while still getting to play with fabric. 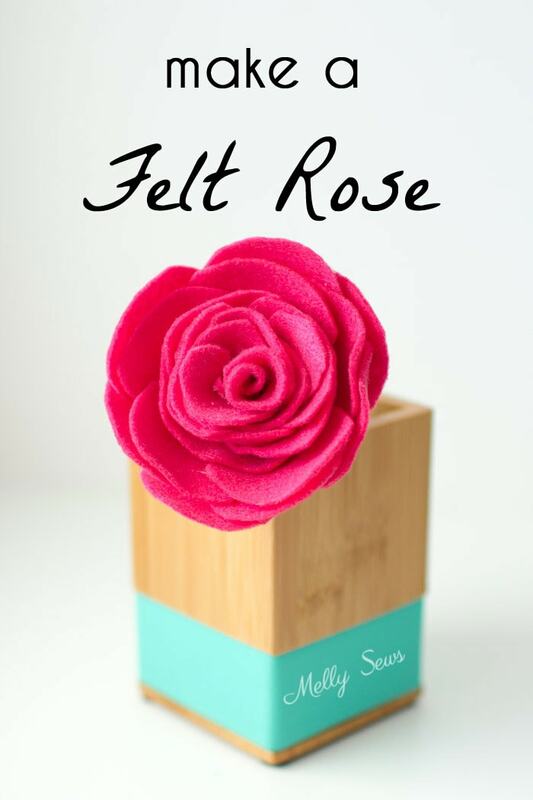 So I’m going to do a whole series this month on some of the different felt flowers I’ve made, starting today with how to make a felt rose. And in case you’d rather download the petal shapes instead of eyeballing them from my images, I have the entire file for all these flowers available for purchase here. Here’s how I did the rose. 1 sheet of 9×12 felt in the color you want your rose, and some scraps of green. For this one I used Fuschia and Moss from this shop. Hot glue gun. Do your fingers a favor and get the low temp kind. Note – if you wanted to, you could hand sew these. That’s the method I would recommend if you want to make them to embellish clothing. 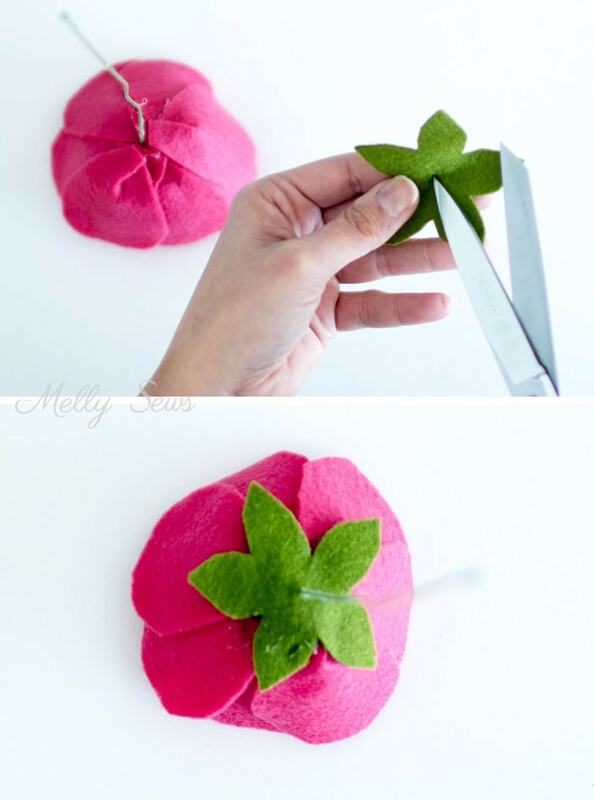 And then either use fabric that won’t fray, like fleece or knit, or add fray check to the edges after you make the flower if you use other fabric. One more note – flowers in nature aren’t perfect. 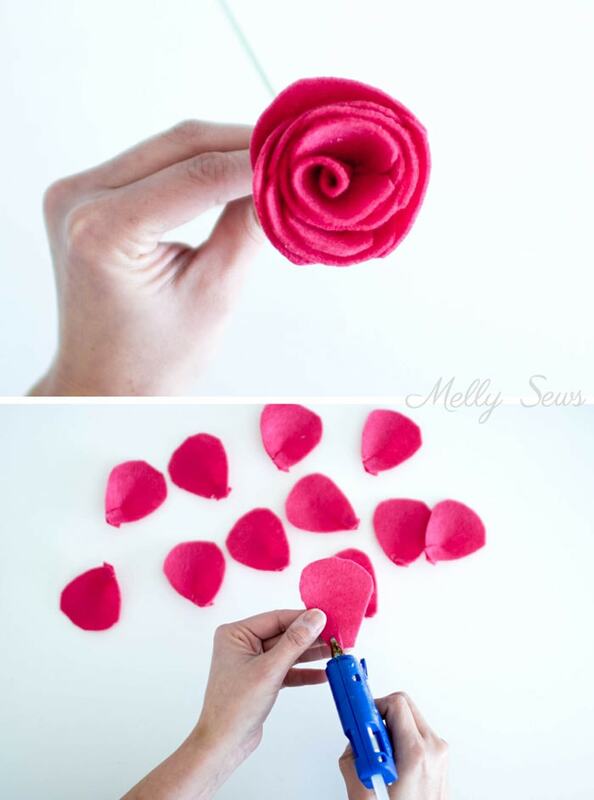 Allow yourself some imperfections while making these, and you’ll get a more realistic looking flower. Remember to have fun! First, draw a circle about 5 inches in diameter, then cut it into a spiral, with the width around 1″ or as close as you can get for the spiral. 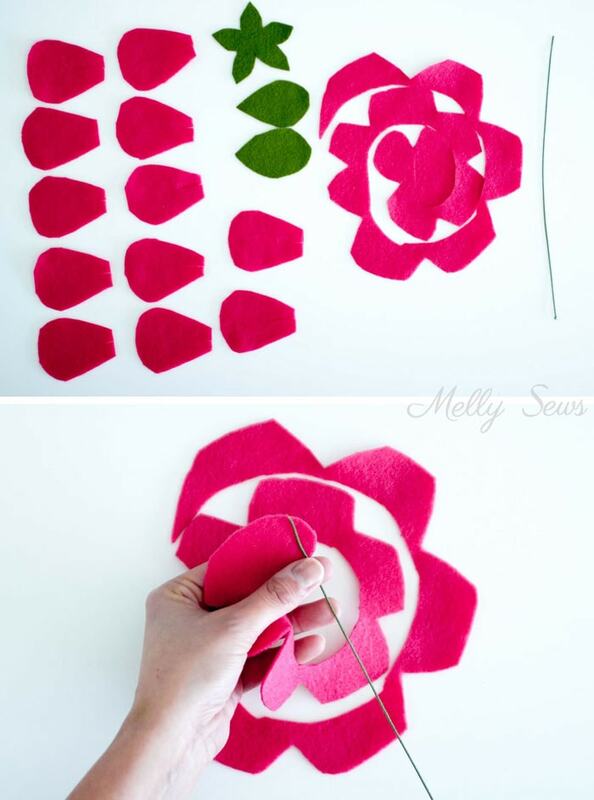 Then, go back through the spiral and cut petal shapes along the outer edge of the spiral. This is what that thing is on the right in the picture below; notice that the rounded petal shapes go from wider on the outer spiral to narrower on the inner part of the spiral. The last one, the innermost part of the spiral, will basically be an oval. It helps to draw this out on paper first if you don’t have a template. Next, cut 12 petals that are about 2 inches tall in a flat ended teardrop kind of shape. Then use this to cut two fully teardrop shaped leaves. Add a calyx that is roughly star shaped. Start with the spiral, holding the innermost oval. 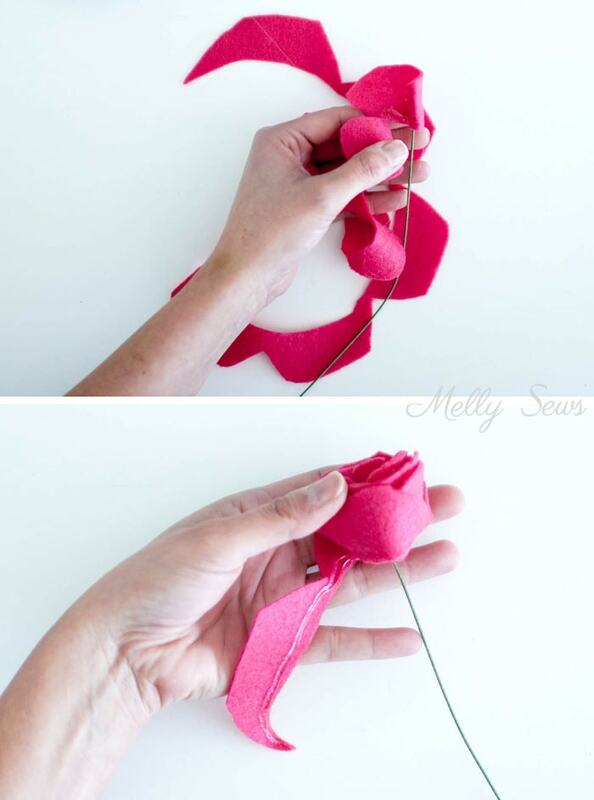 Wrap this around your floral wire, adding hot glue. Then continue to wrap your spiral around the wire, adding glue to the inner spiral edge a couple inches at a time, then rolling it onto the flower. 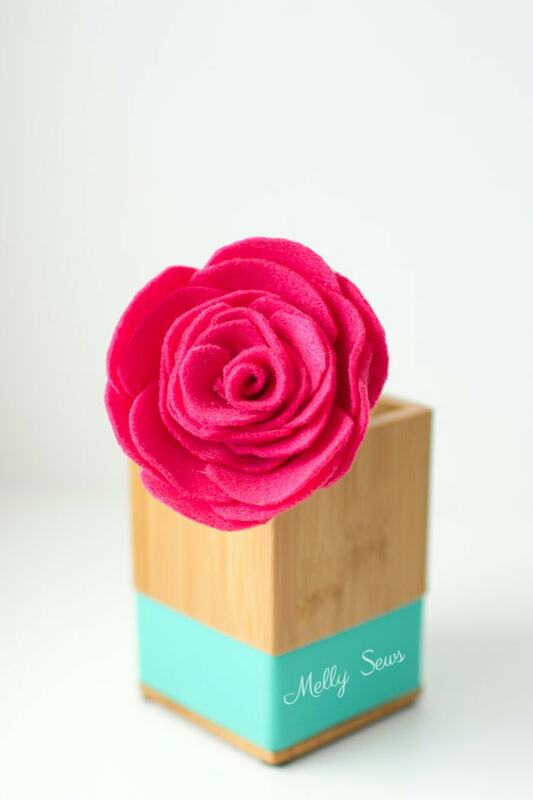 When you’re done, the rose will look about like this. If you wanted mini roses, you could stop here. But we’re going to take it a step further. Take those other 12 petals and cut a vertical slit in each one on the flat end about 3/4 inches long. Overlap the two edges of the slit and add a dot of glue so that the petals cup. 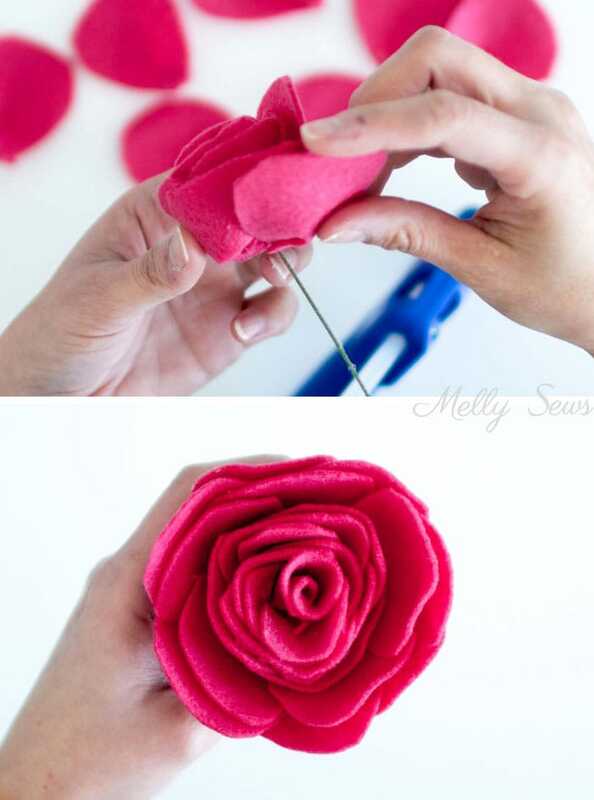 Glue the cupped petals onto the rose one by one, rotating the flower and slightly overlapping each petal edge over the last petal. When you’re done it will look like the picture above. Poke a hole in the calyx and slip it onto the wire stem, then glue. 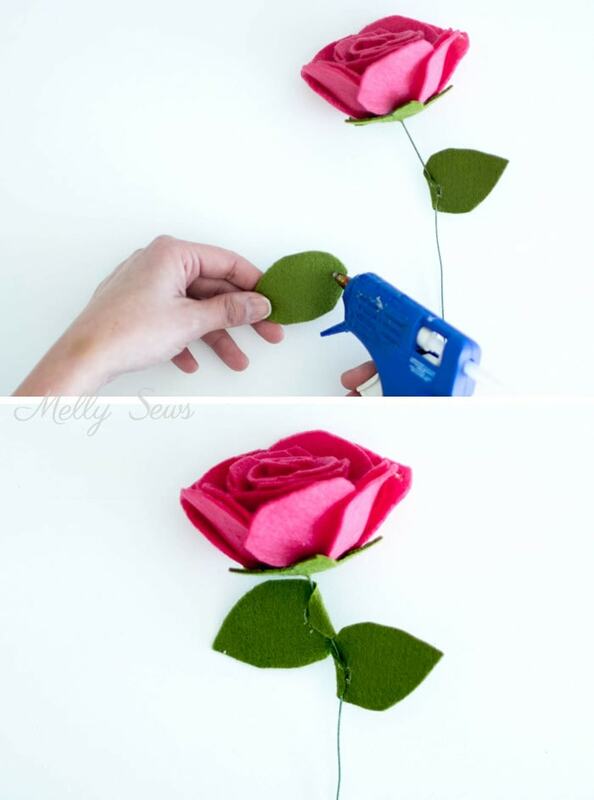 Roll the edges of the leaves with glue around the stem to complete the flower. For a more accurate flower, you could add stems to the leaves out of other pieces of floral wire before glueing on, but I didn’t feel like I needed that much accuracy. Those are SOOOO stinkin’ cute!!!! So…. I’m thinking… how could I add a smaller version of that (just the flower, not the stem) to, say, my daughters sweatshirt? Maybe put some small ones around the neckline? Maybe use something less rigid, like fleece? You’ve got my wheels turning! i LOVE em! Beautiful! Your posts always brighten my day. like it!! many many years ago I took a sewing class thru adult ed program that included things like fabric covered shoes and some great flowers. I am so happy to see your addition of this sort of embellishment to your blog. Do you by any chance have any yarn flowers ? At that same class I mentioned there was a lovely flower made by winding yarn on a dinner fork and not only am I unable to find those old notes but they are missing from that file called memory. Do you know about this flower ? Perhaps it will be among those you will be sharing ?? thank you for this flower series regardless.!! How lovely the roses look! Many thanks to you can’t wait to try it!